Many parents think setting up a visual schedule for their children with ASD or SPD will be a daunting task or to time consuming, so they choose not to make one. In actuality it saves parents/caregivers time in having to deal with behavioral issues. 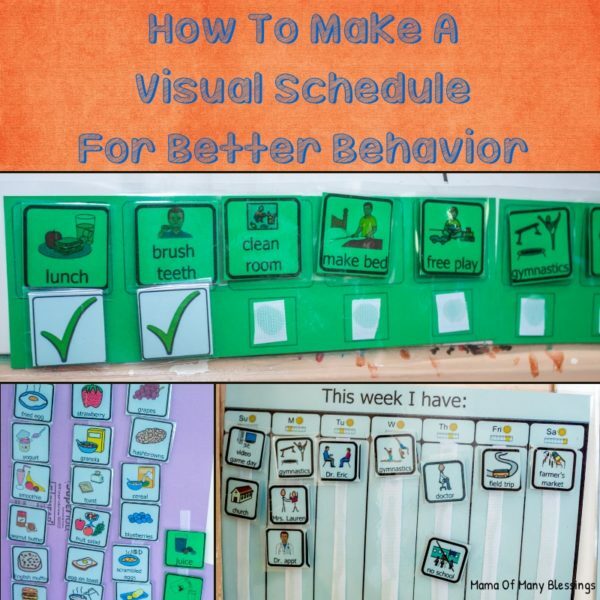 Often parents of children with ASD or SPD who have used visual schedules will say that it has been their most useful resource. Anyone who has an autistic child knows that these kiddos need very structured schedules in their life and they are very visual. 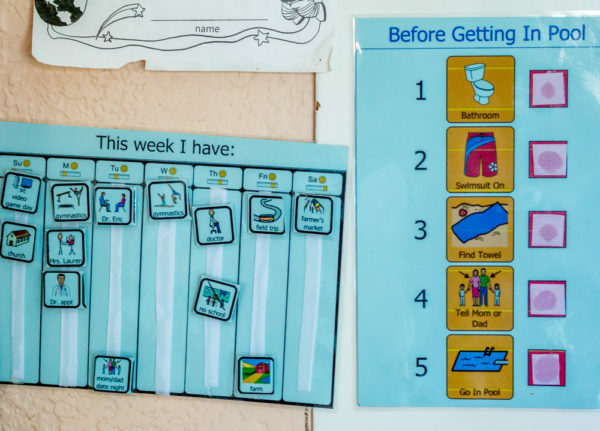 These visual schedules were such a blessing to us, I’m not sure how we would have gotten many of our daily tasks done if we did not have them. 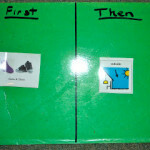 When Ethan was little we used both a visual schedule and the if/then board. As he has gotten older we have changed our visual schedules around to help him better. 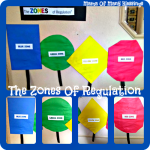 All of our charts were made using Boardmaker Share. You can get a 30 day free trial which will give you time to make some of your own and decide if you want to pay for a membership or not. What happens when you take these kids off of their normal schedule you ask? Well disasters happen. For example, my husband took off for vacation for 1 week. During this time we kept everything as normal as possible to our normal daily schedule. 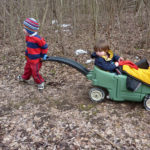 We ended up taking 2 days off of school and our normal routine to get some yard work and pick up done. About 1 month after that time taken off and we were still dealing with major behavior problems with Ethan. When you take the predictable life away from these kiddos they don’t know how to handle changes in their daily routine, they thrive off of a predictable routine. Now I will say that there are time when things come up and our routines just cannot be the way they normally are. If that happens we talk about it a TON before it happens if possible. Since Ethan is now older we have upgraded his visual schedule quite a bit. There are a few of them that we use now. 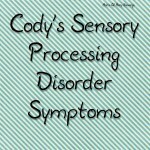 Ethan struggles in a few different areas, as do many kids with sensory issues. These are the things Ethan struggled with. Remembering the steps to something he is going to do that is very exciting for him. Knowing what our weekly schedule looks like. Keeping track of what thing need to be done for the day. Having to many choices for something. Here is a look at our daily activity schedule. On the left we have our morning side and on the right we have a afternoon side. 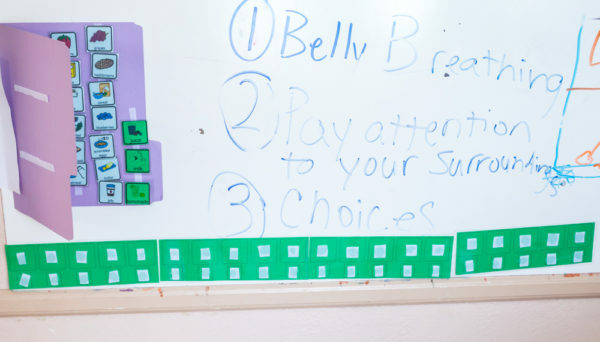 In the morning we take our choices and put them up in the order that we will be doing them for the day. After we finish each of the tasks we put a check under them. It makes things much easier for Ethan to get through the day when he chooses his free time activities in the morning. Choosing in the moment is way to overwhelming to him and ends up meaning big behavior issues. This is the right side to our schedule. The left side of our schedule. 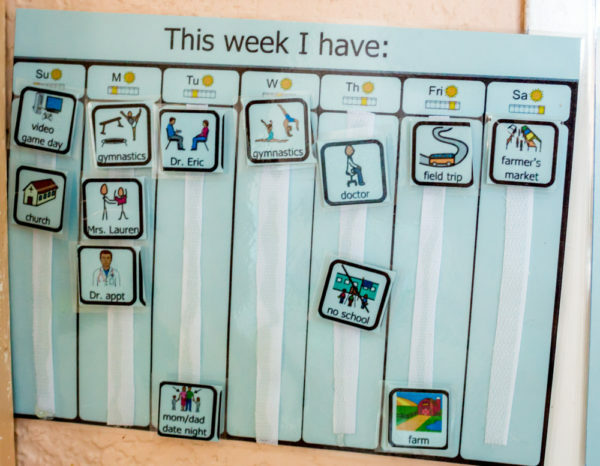 To make our daily activity visual schedules I just printed off the chosen schedules from Boardmaker Share and laminated them together. I cut them out to size and hot glued velcro strips onto the schedule, then hot glued velcro onto the back of the choices pieces. 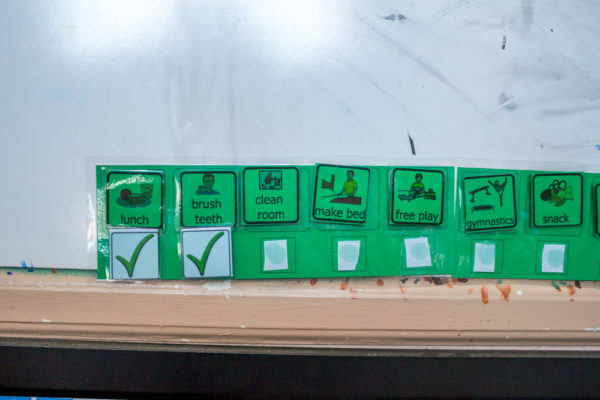 This is our before activities board. 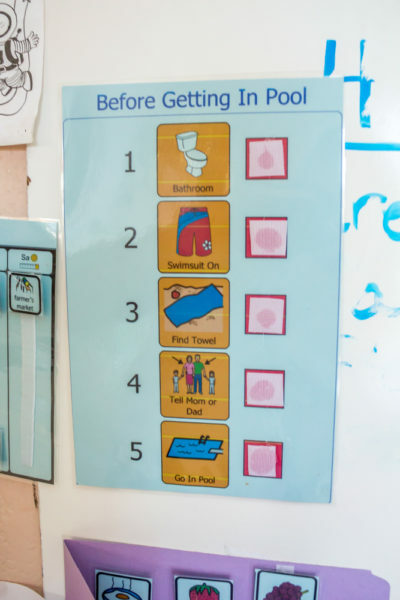 We were having problems with Ethan forgetting to go to the bathroom before going in the pool, or even forgetting to tell us that he was going in it. It was because he LOVES the pool, the proprioceptive input is so calming for him. This board has been so much of a help for him. It would work the same for any activity your child might struggle with. He simply follows the steps and adds a check mark next to that task once it’s done. When he has done everything he can go into the pool. The chart with some of the check marks put onto it. 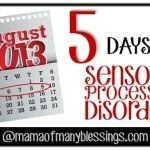 Knowing what is going to be happening weekly has always been a struggle for my sensory kids. 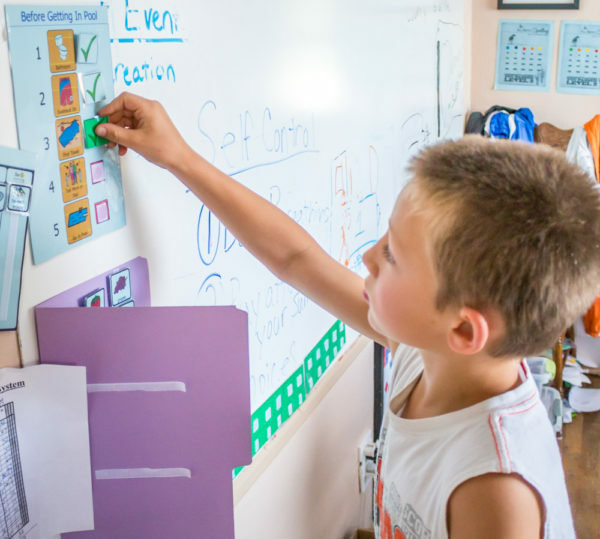 This weekly schedule has been so much easier for them to know what is happening every week! On Saturday night we add any of the things that will be happening on each of the days. We add places we are going, changes in the schedule, doctor appointments, etc. Sunday we talk about things that are going to be happening the upcoming week. At the starting of each day we talk about what is on the schedule for that day as well. A huge issue for Ethan was that he would have major behavior issues when trying to figure out what he wanted for breakfast. 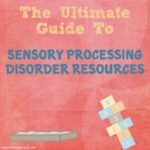 Yes, something so simple to most people can be such a struggle for SPD and ASD Kiddos. So, I printed off a bunch of choices for things we have available for breakfast. 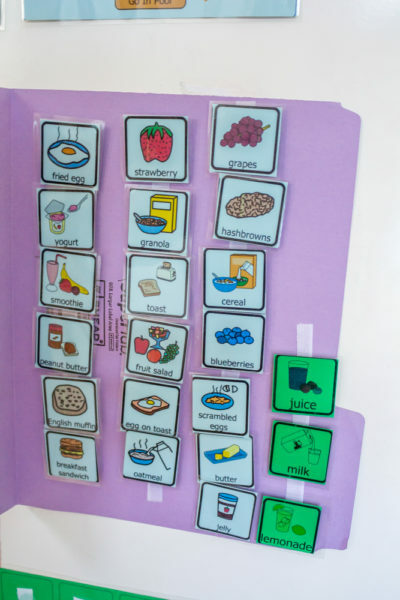 They are all on the board and he pulls a breakfast food off and puts it on the front of the file folder, as well as a drink if he wants one. 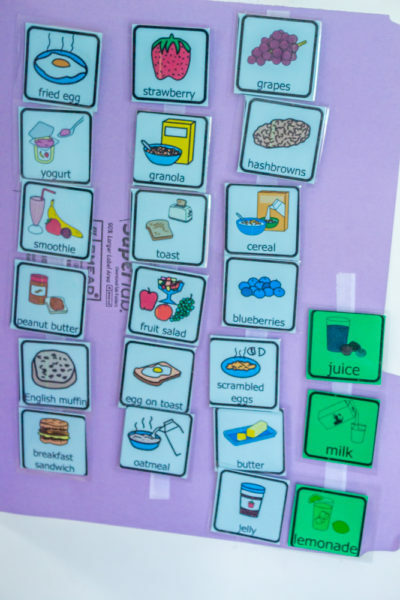 All of the foods are on blue card stock and the drinks are on green so they are easy to see the difference. For this board I used a file folder. On the inside of the folder I put 3 strips of velcro from top to bottom for food choices, and 1 along the side for drink choices. 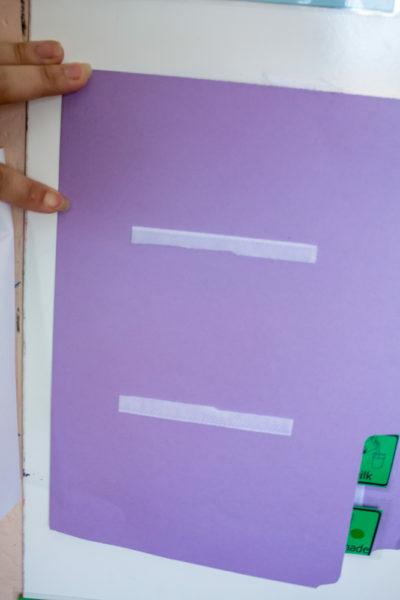 On the front of the folder I added a couple strips of velcro. 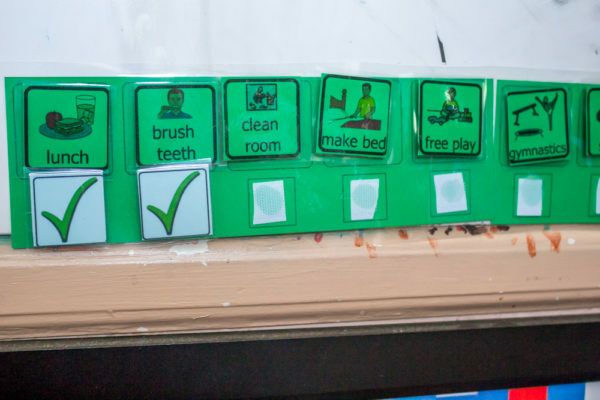 The choices were all found on the board booster site as well and we added velcro to them to stick onto the strips on the inside and outside. These visual schedules have been such a lifesaver for us. 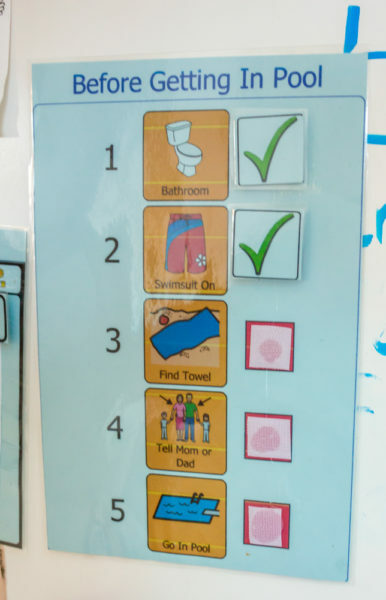 They help kids with sensory issues know what is coming up next, shows them what choices they have. It has eliminated many arguments and problems in our house. 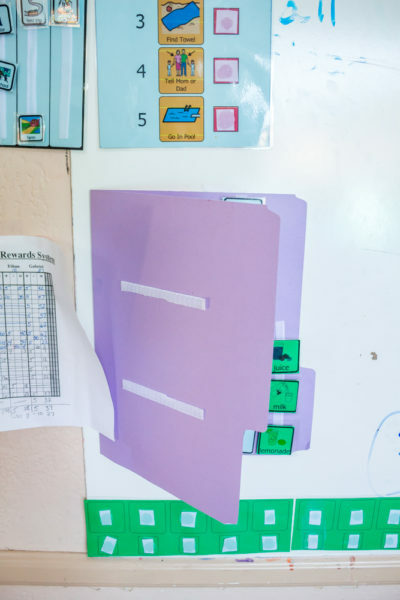 Head over to Boardmaker Share to make your own schedules, I’m sure you will love them! Looking for more special need ideas and helps? 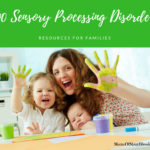 My Special Needs Pinterest board has a bunch of other ideas on it that will help you with many things. 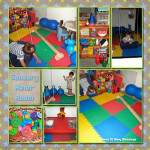 Follow Mama Of Many Blessings’s board Special Needs Helps, Tips, Ideas, and More on Pinterest. I may be linked up with some of these great linky parties. Disclaimer: This post contains affiliate links, read my full disclosure policy for more information! !